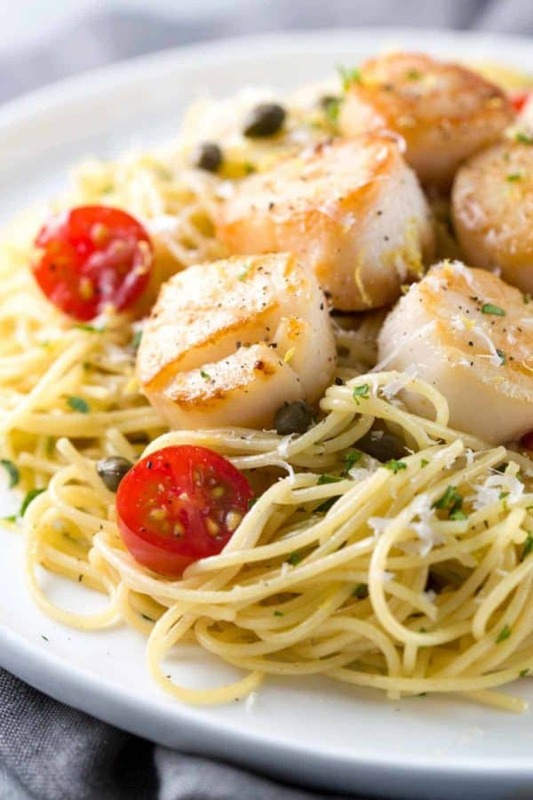 Pan seared scallops with lemon caper pasta is a gourmet recipe for any occasion! Light angel hair pasta is tossed with a citrus white wine sauce and tomatoes. This shop has been compensated by Collective Bias, Inc. and its advertiser. All opinions are mine alone. The holiday season is here which means more great meals enjoyed with the people you love! Are you looking for a meal that will delight any day of the week, or to share with others for a special occasion? A dish that’s always a winner with my family and friends is a comforting plate of Italian pasta, but I like to add a more gourmet twist. Pan seared scallops with lemon caper sauce will wow any hungry guests at your dinner table. Not to worry, it’s straightforward and effortless to recreate, plus I’ve got a special ingredient that takes the flavors to the next level! There are two essential ingredients in this pan seared scallops and lemon caper pasta recipe that makes it so irresistible, the pasta and wine! I wanted to make this dish light, flavorful and bright. Barilla Angel Hair Pasta adds great tasting, high quality and wholesome, tender pasta to the dish. The thin pasta does an excellent job of absorbing and getting coated with the lemon caper sauce to infuse the flavors into each delicious forkful! Hey, there wine lovers! I know you traditionally think of enjoying a nice glass wine to pair with your meal, but the flavors of wine can add some beautiful notes to your cooking as well. For the lemon caper sauce, I used Clos du Bois Chardonnay as my secret ingredient to make the taste pop! If you’ve ever been wine tasting, you’ve experienced that each wine has its unique character. This Clos du Bois Chardonnay is bright and refreshing, with lots of fruit forward notes of ripe apple, pear, and sweet lemon drop. The French style of winemaking under the warm California sun also provides toasty oak, vanilla bean, spice, and butter notes. As you can imagine, all of these complex flavors get infused into the sauce and complements the caramelized scallops like a dream. Whenever I want to create a special dish, scallops are on top of my list. It adds an element of elegance to the recipe, and it’s very simple to prepare. Dry: The trick to achieving a golden brown crust on scallops is making sure both sides are very dry. Use a paper towel to soak up any moisture before salting and adding to the pan. Any excess moisture will cause the scallops to steam instead of sear. Keep it hot! : A smoking hot pan and scorching oil are going to give a dark caramelized color on the scallops. Don’t move the scallops until you are ready to flip. They will brown and release from the pan on its own. I use a stainless steel pan to get a more attractive surface. Time: Scallops cook very quickly, about 2 to 3 minutes on each side. Keep a close eye so that you get a tender, buttery texture from the scallops, not tough and rubbery. The caramelized scallops have a nice golden brown crust and a very mild sweet flavor. The delicate seafood and light angel hair pasta are an excellent pair. If you are looking for other ways to enjoy seafood, try my scallops with roasted red pepper sauce recipe! Now that you’ve got beautifully caramelized scallops and lemon caper pasta to bring to the table don’t forget to pour a glass of chardonnay! Not only do you have the versatility to cook with the wine, but you also get to sit back and enjoy each delicious sip with your meal. It’s hard not to devour this entire plate of pasta! The delicate angel hair pasta tossed in the fresh, savory and tangy lemon caper white wine sauce and herbs is something you can just eat all on its own. The fresh seafood and light pasta are sure to please for any low key or more fancy occasion! What other pasta and wine pairings have you tried? Do you cook with wine often? I would love to hear your marvelous creations in the comments section. What are capers and how do you use them in cooking? Pan seared scallops with lemon caper pasta is a gourmet recipe for any occasion! Light angel hair pasta is tossed in a citrus white wine sauce and tomatoes. Dry the scallops very well with a piece of paper towel. Season both sides with salt. Heat a large stainless steel frying pan over medium-high heat. Add 2 tablespoons olive oil and heat until the oil ripples and begins to smoke. Add scallops to a hot pan without crowding. Cook the scallops without moving them, until the bottoms are a rich golden brown, about 3 minutes. Add one tablespoon of butter to the pan. Turn the scallops and caramelize the second side, about 1 1/2 to 2 minutes. Turn off heat but do not discard the pan. Transfer scallops to a clean plate and lightly season with freshly ground black pepper. Lightly cover to keep warm while making the pasta. Bring a large pot of salted water to a boil. In the meanwhile make the lemon caper sauce. In the same pan used to cook the scallops, turn heat to medium and add one tablespoon of butter and garlic. Stir and cook garlic for about 1 minute, until fragrant but not browned. Increase the heat to medium-high and add 1/2 cup white wine. Simmer, stirring as needed until the wine is reduced by half and you can no longer smell the alcohol, about 3 minutes. Add the chicken broth, lemon juice, zest, and capers, turn heat to high. Cook until sauce is reduced by half (1/2 cup) about 8 to 10 minutes. Turn off heat and add one tablespoon of butter, and whisk to combine. Taste sauce, season with salt and pepper as needed. Cook angel hair pasta in boiling water about 4 minutes until al dente, 5 minutes for more tender pasta. Drain pasta and add to the sauce. Add parsley and toss to combine. Add sliced tomatoes and gently mix. Season pasta with salt and pepper as desired. Evenly divide the pasta amounts serving dishes. Top with scallops and freshly grated parmesan cheese. This recipe serves 4 smaller portions or 2 large portions for a hungrier crowd. I love scallops, but have never been able to cook them properly. Thank you for the great tips. I’ll have to try again. This dish looks like a great place to start! I made this for dinner tonight, and it was fabulous! My wife, the best cook in Sonoma County (one man’s opinion!) was sooo imorssed with this meal. When we each took our fair share, there looked to be enough for a light lunch tomorrow. Thirty minutes later, the pan was empty. We ate it all!! Whoo hoo Paul! What a huge compliment coming from the best cook in Sonoma County 🙂 I’m so elated to hear that you both enjoyed the meal and have some leftovers to enjoy the next day! D-A-N-G this looks good. Capers are like my kryptonite: I cannot resist them. This looks so buttery (I know you used olive oil but it still looks “buttery” to me, in a good way) and delicious. Think you CakeSpy! I have definitely grown a fondness for capers, so much flavors in a little package. It does taste buttery without the butter! Nom! Great meeting you Jessica! I love that you’re a food scientist – and can teach us so much about ingredients and the “whys” and “hows” during cooking. Pleasure meeting you too Jaden! You have been such an inspiration in so many ways 🙂 So happy to hear that you are a fan of food science. I hope I can help other home cooks gain kitchen confidence through science! I had that prob where the scallops didn’t sear well… Wouldn’t the salt also bring out moisture? Because I salted the after drying and put in a cast iron skillet. Hi Henry! Yes salt could definitely bring out more moisture if it sits too long before sauteing. How hot was the pan? I’ve found that if I don’t let it heat up enough it won’t get as strong as a sear. You could also try salting right after cooking to see if that helps with the moisture issue. Great questions! Great conference you Jessica! I love that you’re a food researcher. I love scallops, yet have actually never ever had the ability to cook them properly. Thank you for the wonderful tips. I’ll need to try again. This recipe appears like a terrific place to start! AND I HAVE A MEYER LEMON TREE IN MY BACK YARD !!!!! LOVE LEMON RECIPES !!! Yay Mimi! I love that you got your scallops locally from the farmer’s market 🙂 I am so jealous that you have a meyer lemon tree in your backyard! Hi Jessica, what a fabulous recipe! I want to make it with Zoodles too! I am really enjoying your recipes! Made this last night–it was great! Thanks! Yay! So happy to hear that you enjoyed the scallops Sara! This was really good. I blistered the tomatoes and it made it even better! This was a keeper for sure! The only thing I did different was add some diced yellow squash and some asparagus tips. I sautéed them in the pan with the tomatoes after the scallops and added them back at the end. Yum! I can’t wait until breakfast for the leftovers! I love the addition of the extra vegetables John, I will have to try that next time! I’m wondering if the wine can be substituted for a cooking wine. My husband and I currently aren’t drinking and I don’t want to waste the rest of the bottle. Hi Amanda- Absolutely cooking wine could be substituted with white wine. What kind so you have? I ended up using regular wine. I will have to wait until we have guests to drink the rest! What kind would you suggest for the future? Hi Shelby- Yes, you can substitute the chicken broth with vegetable broth/stock or seafood stock if available. Does the zest just go in with the juice? Thank you for sharing this delicious recipe!! I made with orzo pasta and added Sauge leaf for cooking the scallops, it was ???????????? Incredible! Thank you so much for the scallop cooking tips- first time I’ve ever made them perfectly! I got lots of compliments. Whoo hoo! I am so proud of you 🙂 Way to be a rockstar cooking pan seared scallops perfectly! So good! I drizzled a little lemon juice on the finished product for a little extra zing. It’s a good thing my husband doesn’t like foods with alcohol in them, because I ate the whole thing! And I’m a tiny person ???? Thank you Stezy! I seriously have the biggest smile after reading your comments 🙂 So happy that you enjoyed the dish! I was looking for a pasta dish to go with my scallops, and so glad I found this recipe. I made this 2 days in a row because it was so good! I love capers but didn’t have them on hand, but even without them, it still tasted delicious. I’d have to make this again next time with capers (and fresh lemon and parsley). I also didn’t have parmesan cheese but it was fine without it (less calories too lol). Thanks for the recipe. Thank you for your feedback Betsy! I’m happy to hear it still turned out well without the capers. So good!! I got a bag of the frozen mini scallops for $10 at Earth Fare and seared them in batches. I also choose to add the tomatoes with the broth because I prefer them cooked down and like to “pop” the juice out into the sauce. Overall with the mini scallops it’s an affordable weeknight pasta dish! Wow, you hit the dinner jackpot Kim! Holy. Moly. One of the best dishes I have ever had. I could have eaten this whole thing by myself! This one is a winner! Thanks for this recipe Jessica! Absolutely delicious. I too licked the plate clean. Never cooked scallops before and was pretty nervous about it. I think we’ve found a new favourite! Will definitely try more of your recipes. Thanks again. I can’t use wine in my recipe. Should I substitute something else (more chicken broth) or just cook it without. Hi Pamela- You could add grape juice or juice omit it from the recipe. Thanks! Thank you for your feedback Vicki! Angel hair pasta would be amazing! wondering if this can be served cold as a pasta salad. Going to a pot luck and have to include bay scallops and Meyer lemon. Sounds wonderful.